The group temples of Jainism are situated on the Girnar mountains in the Junagadh District of Gujarat, India, situated near Junagadh. 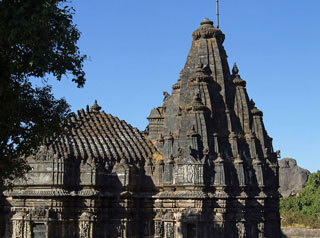 There are temples on the hill sacred to the Digambara and the Svetambara branches of Jainism. Girnar was anciently called Raivata or Ujjayanta, sacred amongst the Jains to Neminath, the 22nd Tirthankar, and a place of pilgrimage before the days of Ashoka, 250 BCE. Situated on the first plateau of Mount Girnar at the height of about 3800 steps, at an altitude of 2370 ft above Junagadh, still some 600 ft below the first summit of Girnar, these temples of Jainism have marvelous carvings in marble, which can be compared to those of Delwada near Mount Abu in Rajastan. These temples attract devotees of both Shwetambar and Digambar sects of Jainism. This article uses material from the Wikipedia article "Girnar Jain temples", which is released under the Creative Commons Attribution-Share-Alike 3.0 License.